Seeing 3 MINIs, weaving in and out of traffic, barreling down the stairs and leaving a chopper for dead with gold bricks in its rear boot opened my eyes into the world of hot hatchbacks. The remake of The Italian Job undeniably rebooted the interest for the marque. 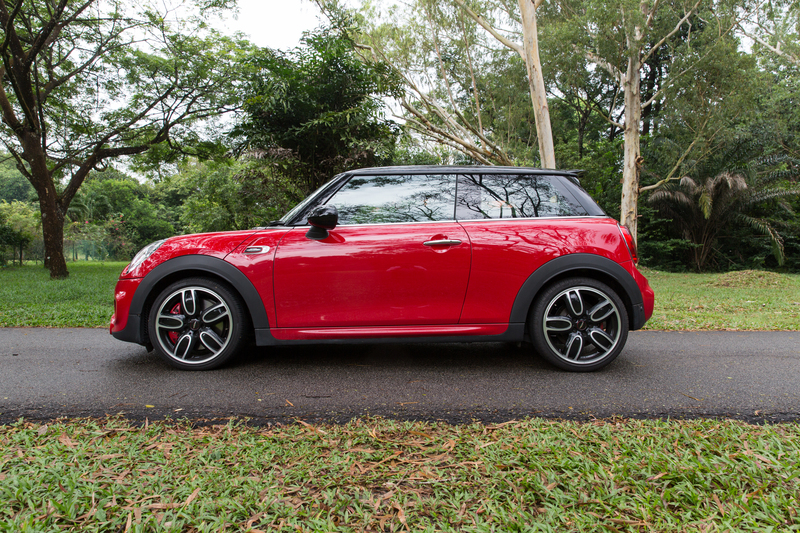 After driving the full-blooded first generation of the MINI Cooper extensively in 2006, I finally put meaning into what fun in driving is all about. That John Cooper Works (JCW) was go-kart first, car a distant second. The whine from that supercharger combined with housefly-like reactive abilities never failed to put a smile on my face. Since then, MINI expanded its lineup drastically and I have no qualms saying that I turned a blind eye for many years. You spot the big, bulbous creatures (Clubman, Countryman) roaming the streets, looking slightly awkward with a badge that means something small quite explicitly. The Marketing department might be on a roll winning battles but not the war. 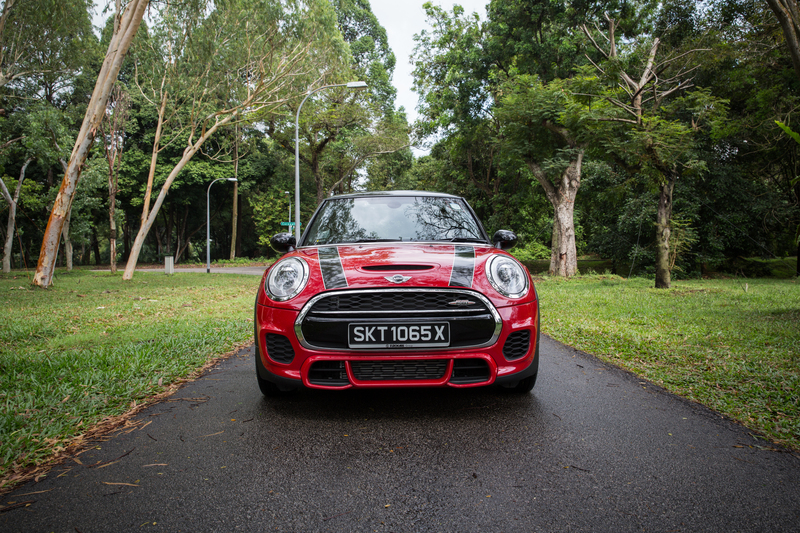 The Cooper will always be the heart of MINI. No 911? No Porsche. And this 2015, third generation JCW attempts to show us how it will fight in a near stifling, hot hatch segment. You approach it and start to giggle. With cars becoming more and more like bland boxes, setting your eyes on a MINI is always an interesting start to the day. This JCW balances out its cheekiness with aplomb, dressing itself with more aggressive bodywork and a chili red paint scheme. The front bumper and wheel design seems a bit too funky, but as a whole it is an attractive, loud little club racer of a thing. Open the doors and you get hit with another dose of its extroverted character. 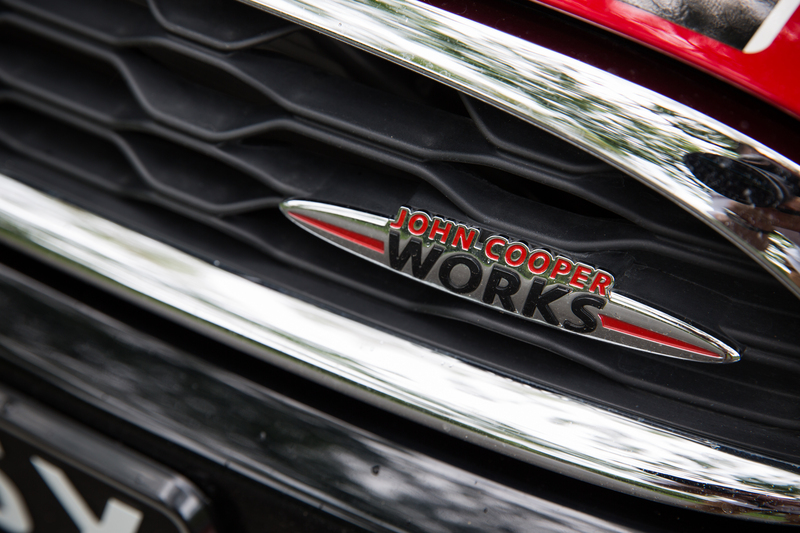 If the JCW is a day in the week, it will surely be Friday. A generous use of round design elements contributes to this, amplifying the car’s quirky and friendly persona. The LED outer ring of the gargantuan, almost laughable infotainment screen even lights up unabashedly in different colours depending on the driving mode you are in. At night, drop some trance tracks and you got a mobile club going on. Harsh, rude plastics still dominate the cabin and it is disappointing to see MINI not up the ante in this department after all these years. You will soon forget about the plastics and silly lights the moment you flip down the bright red start switch. The 2-litre, BMW designed 4-cylinder twin-scroll turbo engine fires up and the sports exhaust growls dirtily into life, throwing hints that this isn’t your pedestrian MINI. 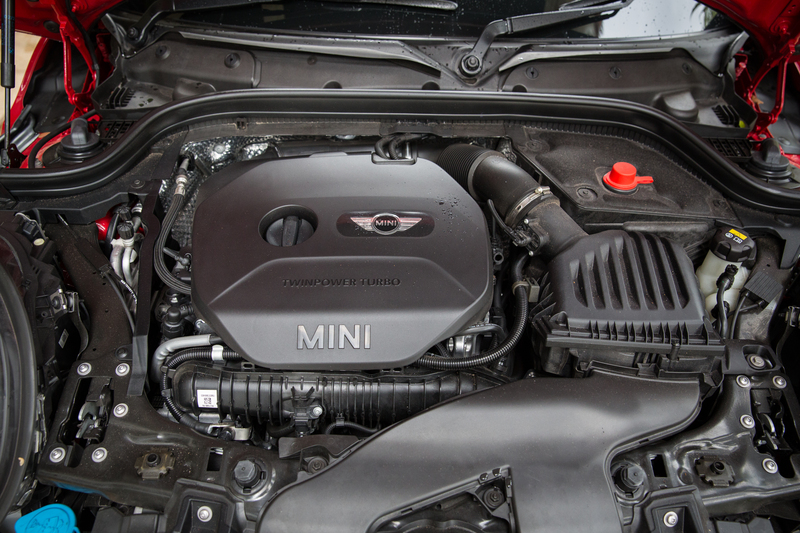 This engine, though similar to the watered down Cooper S, has been heavily massaged to be worthy of the JCW name. New pistons, additional cooling ancillaries for higher boost, lower compression ratio and remapping of the ECU bumps horsepower to a total of 231bhp. Torque jumps big here compared to its predecessor, some 23% to 320nm. In plain English, for a hatch that only weighs 1205kg, it hauls your gold bricks rather effortlessly. It talks to the front wheels via now what seems to be the antiquated 6-speed Steptronic automatic, torque convertor gearbox. It would have been amazing if it were mated with the acclaimed ZF 8-speed that has become the gold standard of all automatics. Next version maybe? Slotting the long, truck like lever into D and the JCW potters around smoothly like a thoroughly modern, civilized car. Most modern cars feel extremely loose and lethargic in the default setting, minimizing fuel consumption and possibly to justify a case for including a sports mode. 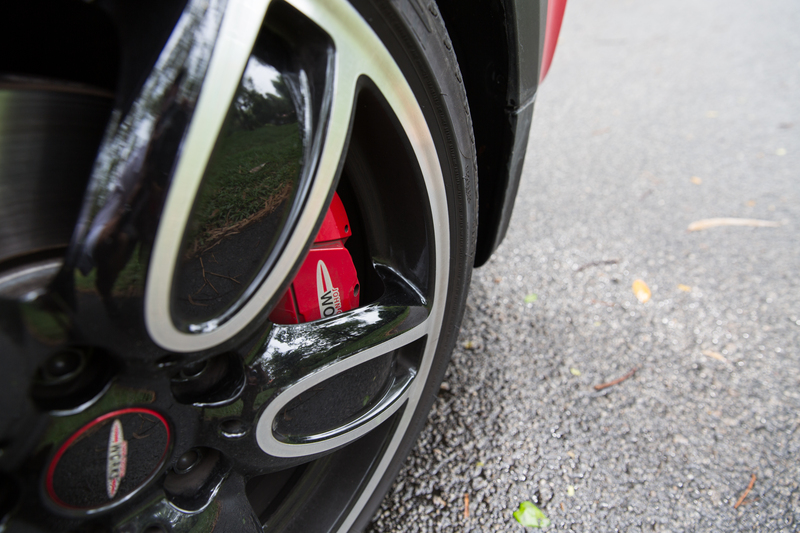 The JCW defaults in the casual driving MID mode, and it is supremely calibrated. The chassis feels taut and throttle response has been tuned to the tee, allowing the car to waft you along with enough urgency without having to switch to the sports mode just to make the car feel normal. BMW needs to apply this to their own cars, pronto. By integrating the turbocharging system within the cast steel manifold, exhaust gases travel a much shorter route to the turbine, allowing for an early and powerful response. I’m impressed. The next 5 minutes in the car was spent trying to activate the sports mode. Instead of a magic button, I found what looks like a lazy Susan attached to the base of the gear lever. 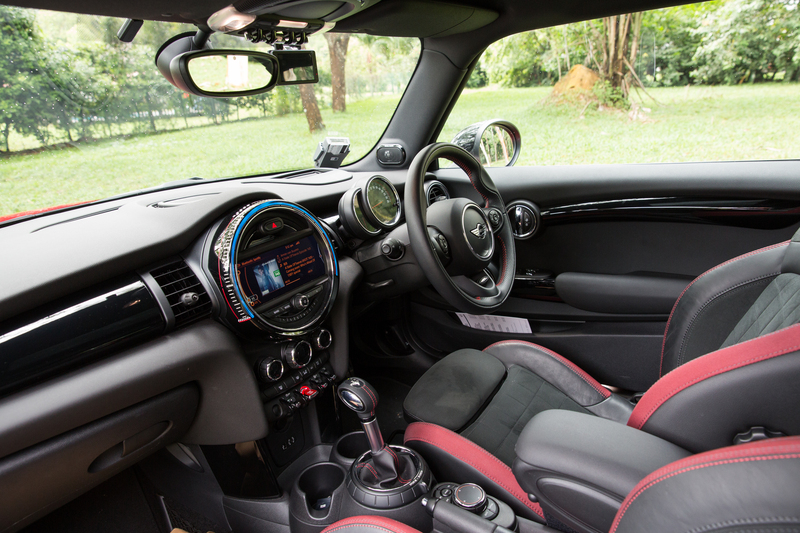 Quirky as MINI will always be, you flip the switch sideways once to your left and the car jolts into action. You feel it priming itself through your bum, ready to attack the ensuing tarmac with that happy face. The gearbox downshifts to the appropriate gears with the suspension and steering tightening itself up in harmony. You slide your hands towards the 9 and 3 o’clock position and flick the nasty plastic paddle down by one more gear. The revs climb albeit forcefully and the sports exhaust crackles and pops on the overrun. You feed the throttle in fast but linearly, guiding the exhaust gases into the hot side of the turbo and gosh, the car surges forward as a singular unit, propelled by a tidal wave of torque available from only 1250rpm all the way to 4800rpm. At 5200-6000rpm, 231bhp of power is at full disposal before running out of breath. The cookie jar is always at arm’s length and it makes the car thoroughly enjoyable to hoon. Mashing the loud pedal doesn’t cause any noticeable torque steer despite being oddly equipped with plain Jane, Pirelli Cinturato P7 tires. Torque Steer Compensation function built within the JCW’s electromechanical steering helps to dial out any unwanted self-steering tendencies found so commonly in high powered, front wheel drive cars. Trick stuff. In the sportiest setting on battered roads, the JCW with increased stiffness from the dampers and use of highly rigid steel throughout the body caused more jiggles and hops than we would have liked. Like modern BMWs, the car can be configured on the fly to separate the drivetrain from the chassis, allowing the driver to enjoy maximum performance from the engine with a softer ride or vice versa. The Electronic Differential Lock Control (EDLC) at the front axle plays a major part in this, shuffling up to 100% of its drive torque to the wheel that possesses the most grip, minimizing wheel spin at the unloaded corner. 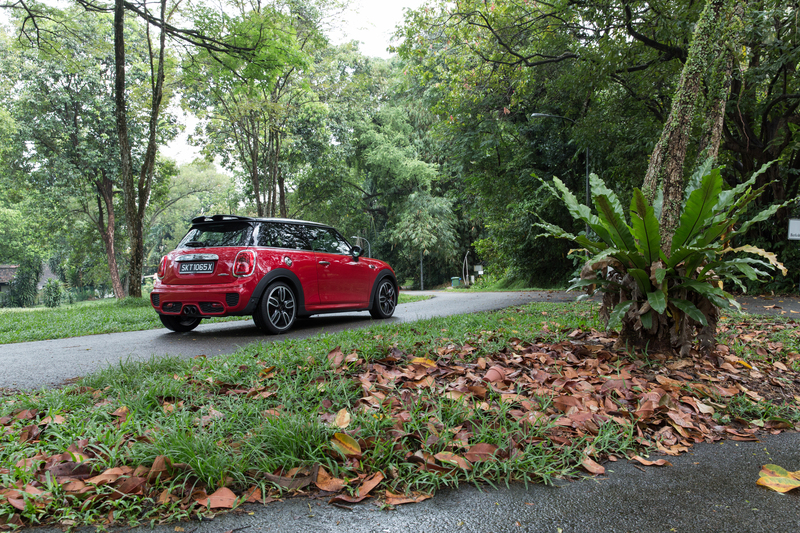 You can hurl the JCW into the most audacious of angles and feel the systems work in unison, maintaining its cornering line and saving you from a certain tree. Its decent weight, sharp chassis and short overhangs creates a low polar moment of inertia, resulting in a darty change of direction that the Cooper is always famous for. When your heart rate goes up one too many, you lean on the brakes lightly and immediately feel the potential power that lurks beneath. The 4-pot Brembo system isn’t grabby and overly servoed, delivering consistent, core-flexing deceleration from start to finish. 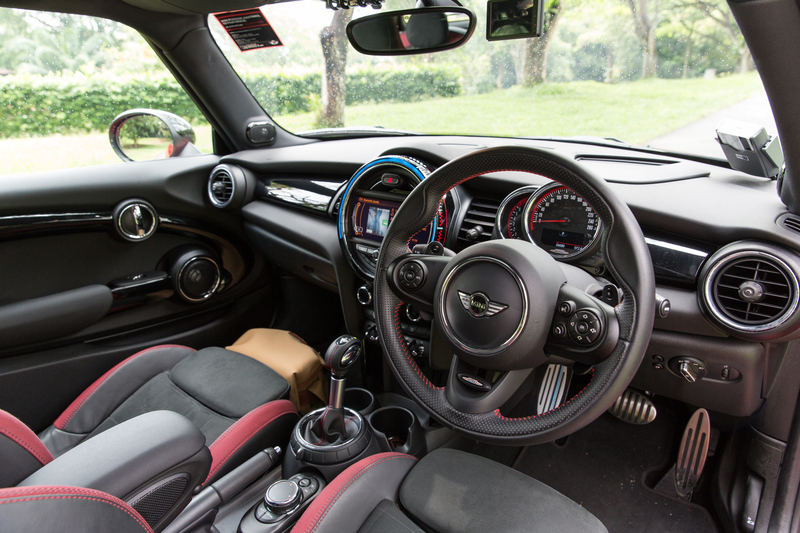 The JCW encourages you to take liberties with it, especially with such a confidence inspiring safety net in place. You can only go as fast as your brakes my friends. As I parked and let the car tick itself cool, I felt restless and wanted to jump back in for another senseless drive. Do I really need anything more for the occasional, 3am spin to the horizon? We are now bombarded by cars with performance figures that ring more like telephone numbers but yet feel like numb, caged lions in the wild. Numbers don’t relate to fun and in this age of modern cars, this feeling is starting to be a rare commodity both manufacturers and drivers are willing to give up. I’m stoked that MINI has stayed true to its go-kart roots with the JCW. Yes, this generation has grown portlier, taller, looks that match the eccentricity of Elton John and arguably not the best overall hot hatch sensible money can buy. But in the end, the sum of its parts delivers driving fun I find so hard to let go of. MINI is back.